September 2015, 58 pages. DeVos Institute of Arts Management, 1300 Pennsylvania Ave NW, Suite 410, Washington, D.C. 20004. (301) 314-0963. www.devosinstitute.net. In 2015, a large number of arts organizations of color were identified by the DeVos Institute as struggling  in some cases desperately. While many of these organizations still managed to produce important artistic and educational work, the majority were plagued by chronic financial difficulties that placed severe limits on what could be produced, how much could be produced, how many artists were trained, and how many people were served. As macro trends emerged that threatened the U.S. arts sector as a whole, from cuts in government funding to the proliferation of cheap online entertainment, organizations of color were particularly vulnerable. This study was commissioned by the University of Maryland, College Park. 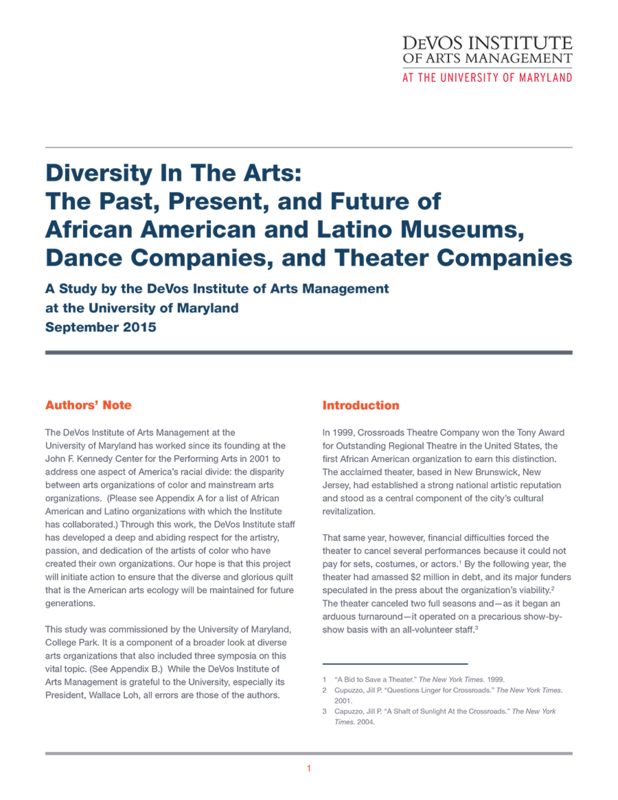 It is a component of a broader look at diverse arts organizations that also included three symposia on this vital topic.